Tomato sauce doesn’t have to be complicated, especially when you have a busy schedule like I do. With the freshest ingredients you can get and a bit of patience you will be rewarded with you won’t believe you did it yourself and from scratch. Included in my CSA box were some tomatoes in various sizes and colors. I particularly like the baby Romas. Also in the box was some amazing Thai basil. I decided to make a sauce to compliment the bucatini I got at Glorioso’s (the best Italian market in the state!). 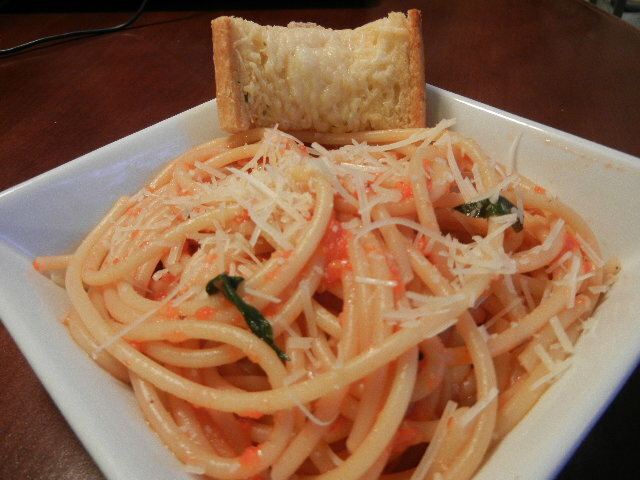 This recipe is inspired by Martha Stewarts Spaghetti 101 episode. With this recipe, everything is fresh, nothing is canned. I love this recipe for its simplicity. I’m not stirring sauce all day (not that there is anything wrong with that. I just don’t have the time). I can get dinner on the table at a decent time and everyone is happy. I also love how versatile this sauce recipe is. You can adjust any of the ingredients to your liking. My family loves it when I amp up the garlic and red pepper flakes. If you are pressed for time and craving a pasta dish. Try this one out. First thing you need to do is take your fresh tomatoes and turn them into a puree. I prefer taking the skins off the tomatoes. 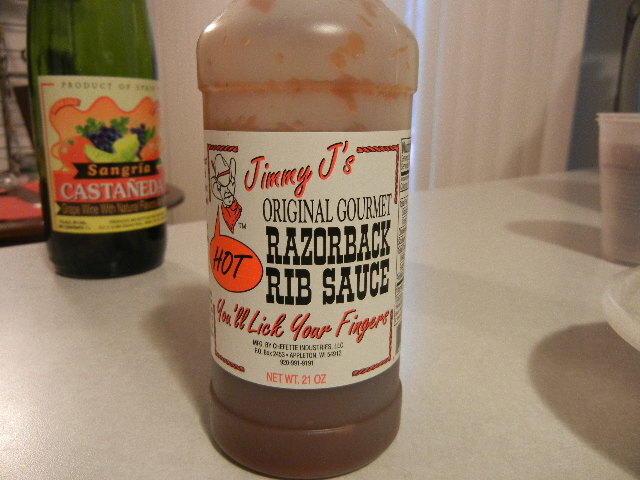 You don’t have to, but it does make for a nice smooth sauce. Taking the skins off a tomato isn’t as daunting as it sounds; in fact it’s pretty simple and quick. 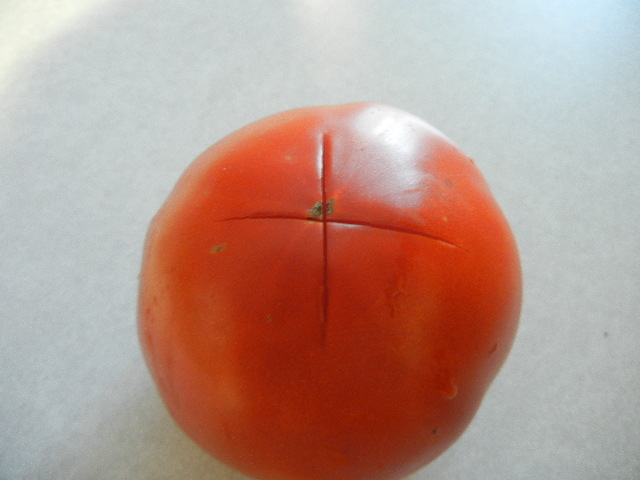 Take a paring knife and cut an X on the bottom of each tomato. Place your tomatoes into a pot of boiling water. You only need to keep them in the water for a minute at most. When you pinch (very carefully they are HOT) the tomato and the skins slide, take them out of the water and put into a colander to cool down to where you can handle them freely. The skins will slide ride off. Easy! Place skinned tomatoes into a food processor, food mill, blender whathaveyou. 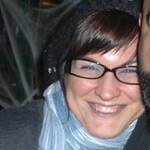 Puree. You can do a smooth puree or you can leave it a bit chunky. Your choice. In a large sautee pan, sautee onions until translucent. Add garlic and sautee until the garlic is soft. Add red pepper flakes, tomato puree and red wine to onions and garlic. Stir until thoroughly mixed, simmering on medium heat. Now is a good time to season with salt and pepper. This is the stage when I determine if I need to add more red pepper flake or not. Add the oregano and basil and let the sauce simmer on medium-low heat. It will start to thicken up (but not much) and look and smell amazing. This sauce won’t be a thick sauce like you get in a can or jar. It will be on the thin side and will coat pasta nicely. 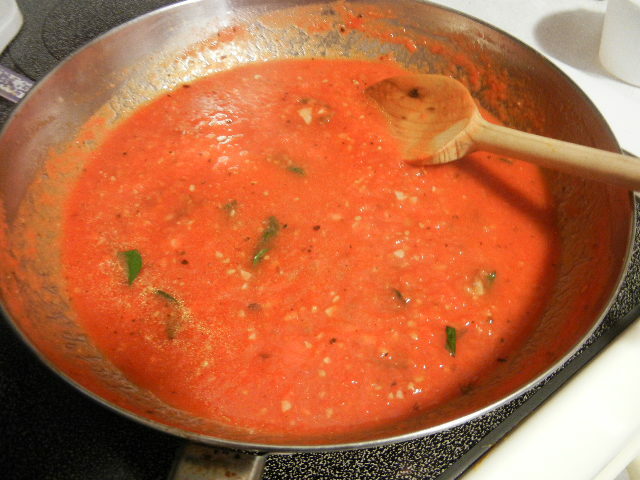 If you aren’t comfortable with a thinner pasta sauce, you could use a tablespoon of tomato paste to thicken it up a bit. I personally don’t think it needs it. Again, preference. The taste is incredibly fresh. You really get flavor of the tomato. I love the kick of heat you get and all that wonderful garlic. Sprinkle some fresh parm on top and serve with piping hot garlic bread and enjoy! I’ve never really cooked with these beauties until I became a CSA member. I’ve made a pie. I tried and failed at making preserves. This season I decided to go big or go home. 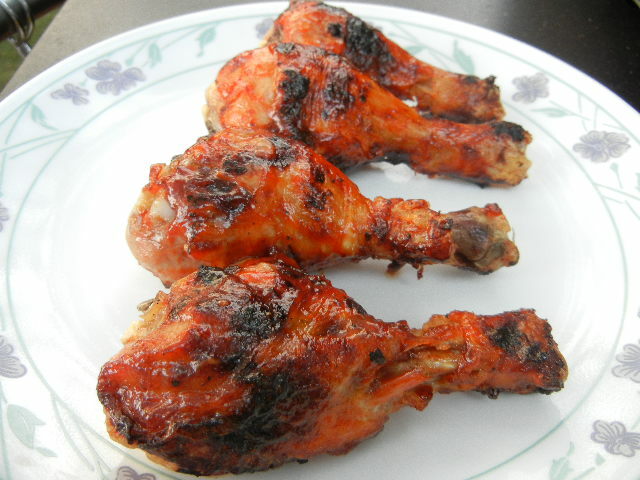 I had found an old recipe for a cherry hot sauce using Door County cherries. 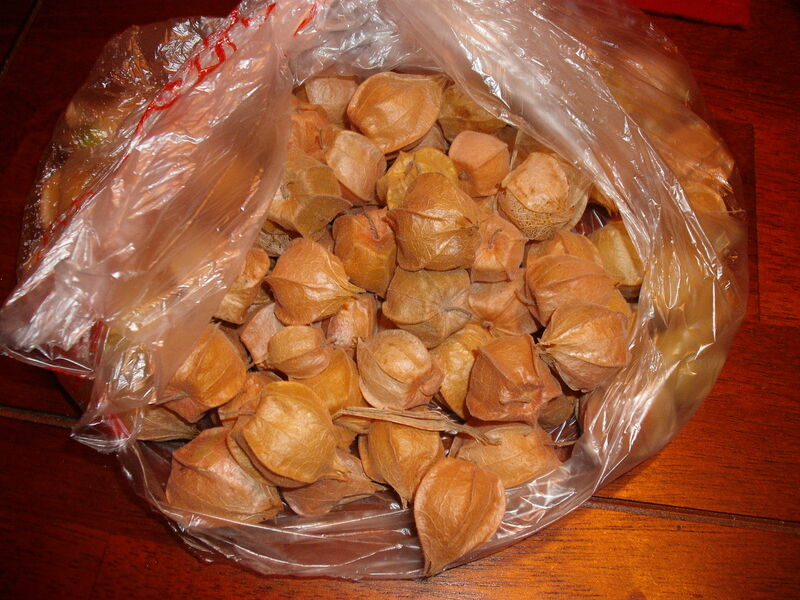 Granted, ground cherries aren’t as sweet as a Door County cherry; they still have great flavor. The recipe also called for a habenero pepper. I used the jalapeño pepper that was in my box. 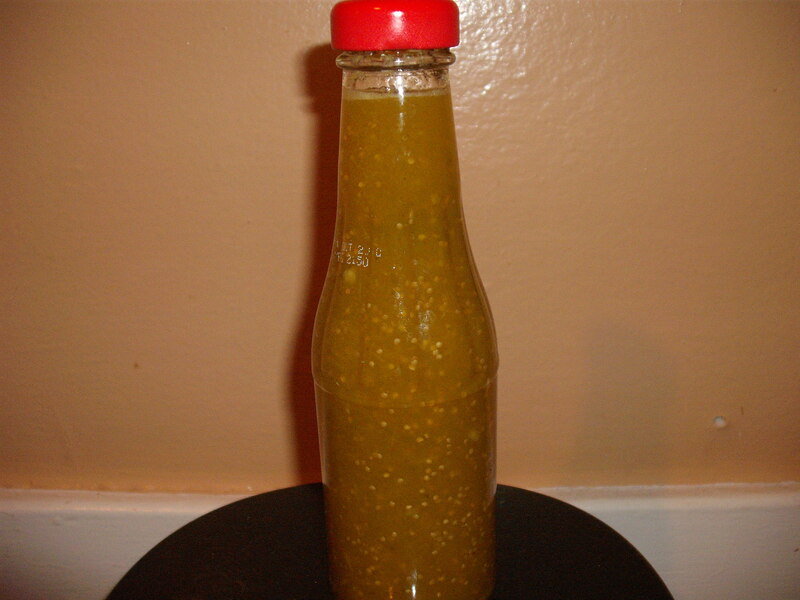 This recipe is easy, quick and you can control how hot or mild you want your hot sauce. This recipe calls for granulated sugar, but I find that honey gives it a richer under tone. Besides, honey is natural, granulated sugar is not. 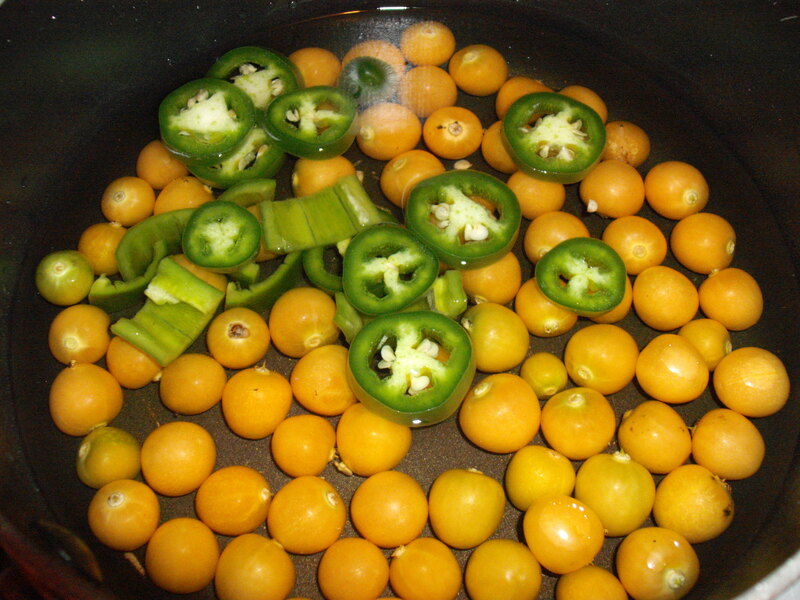 In a sauce pan add the vinegars, ground cherries and pepper. Boil until the cherries and pepper are soft. This took me on a gas stove about 15 minutes. Let cool then add to a food processor and puree. Put puree back into the sauce pan and add the honey and salt. Bring back to a soft boil and reduce until desired consistency. Funnel into clean jar and et voila!